While I always do some sort of grand spring-cleaning project, usually involving the basement, garage and my closet, I never think to clean out my pantry. But when my friend Lucy told me that she found a bottle of vinegar that expired in 2006 and boxes of gelatin with a use-by date in 2008 when she cleaned out her kitchen, I thought perhaps it was time to take a look. Luckily, it was easier than I thought. Here’s how I did it (and if you use these guidelines it’ll just take you a few minutes, since you won’t have to spend time debating whether to keep or not to keep). • Almost everything in my pantry was tagged with a date and one of these phrases: “Use By,” “Best By” or “Use Before.” I ditched everything that was past its date (see ya, chicken gumbo soup from 2009!) and arranged similar things together. • I put items with sooner use-by dates at the front so they’d get used first and tossed anything that was in an unlabeled random container. • I sniffed all the dried herbs and spices and dumped the ones that didn’t smell like anything anymore. • I made a list along the way of what I needed to replace so I wouldn’t be caught short making dinner one night. • Then I bagged up everything I had bought that was still good but I knew I wasn’t ever going to use and dropped it off at the local food bank. 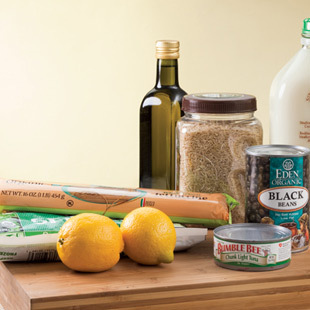 Chime In: What 5 pantry items do you always have in your kitchen? Look at all that space! Now it’s time to stock up on healthy staples! Here are my top 5 healthy-cooking staples to stock in your pantry. I usually make pasta for dinner once a week, but I make sure I have a few boxes in my cupboard because it makes a great I-don’t-wanna-make-dinner dinner. All I have to do is heat up a jar of sauce and cook some pasta and dinner is ready in minutes. I like to stock my pantry with a few types of canned beans plus different kinds of dried ones for when I have more prep time. Canned beans are a great emergency-meal ingredient. I just cook some rice, heat up some beans, wilt some spinach, chard or other dark leafy green, then assemble into what I call “Mexi-bowls,” topped with shredded cheese and salsa. Perhaps my favorite pantry staple, I love canned tomatoes because they can become anything from soup to sauce with just a few other pantry ingredients. Having different varieties available—sauce, crushed, diced, fire-roasted, with chiles, with herbs—lets me be more creative. Sardines, salmon, tuna—I make sure to have all three on hand at all times! They’re all great sources of omega-3 fats, plus I can open a can and turn any salad into a meal. I always have a few boxes of different kinds of broth, like chicken, vegetable and beef. They’re great for making “clean-out-the-fridge” soup, reheating leftovers and cooking whole grains, among other things.